Remember pass the parcel? It’s about to meet the 21st century, but the gift is in the giving! 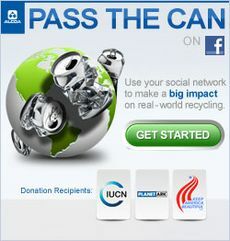 A new facebook app called Pass the Can is set to raise funds for Planet Ark to develop recycling educations lessons for Aussie school kids. Crush a can on the app, and pass it on to as many friends as you can, because every pass generates a $1 donation shared between Planet Ark and two other green groups! You’ll also learn some interesting facts about aluminium recycling along the way. The “Pass the Can” app is just one of many fantastic initiatives that Alcoa Foundation – the charity arm of the company - develops to help not for profit organisations around the world. The Alcoa Foundation is the Major Partner of Planet Ark’s Recycling Near You resource, which helps the public find out what they can recycle in their area.